Fiscardo view apartment & Free boat rental ! Private Fiscardo view apartment in center of Fiscardo with free deluxe boat!!! Fiscardo view apartment with free deluxe boat ! Fiscardo view apartment is very private spacious (75m²), 2 bedrooms , 3 bathrooms, kitchen - living room, washing machine , A/C Free WiFi, with nice harbour view, ideal for couples or familIies with 5/6 persons , located in the heart of famous Fiscardo Kefalonia ,a breath away ( 2 minutes walk) from the famous and picturesque port with its taverns, cafes, bars, souvenir shops, super markets, rental boats , ferry to Lefkas and cruises to Ithaca. An 1-minute walk away is the nearest beach 'Elies' (Olives). Also, in only two minutes walking distance you will find a children's playground . The beaches Emblisi and Foki ( both famous and beautiful) is within10 and 15 minutes on foot or 2 minutes by car. The place is ideal for various activities, with easier -but at the same time amazing- hiking among lush vegetation, the marked trails of the village, that are waiting to be explored. "Fiskardo view apartment" is a spacious, versatile, beautiful and affordable apartment in Fiscardo. The apartment balconies giving you a great start to your day with view to the sea! Inside the rooms, the decoration is simple, well designed and modern, making you feel intimacy from the first look. The apartment consists of 2 comfortables A/C bedrooms, 3 bathrooms,a seperate space with a fully equipped A/C kitchen- living room , hallway ,two balconies , Free WiFi. The master bedroom has en-suite bathroom with shower offering a hairdryer, a big double bed and a single bed for an extra person, wardrobe, TV and air conditioning, safe box. The doors open from the master bedroom and the living area leading to a big private furnished balcony ( 9 meters long and 1.20m wide) overlooking the picturesque port of Fiscardo.The second bedroom has two single beds which if you prefer are joined in a double bed, wardrobe, en-suite bathroom with shower, TV and air conditioning. It also has a private balcony of 2.5 meters (also 1,20m wide), overlooking the mountain & lush garden.The kitchen area consists of a fully equipped kitchen with large cupboards, dining - living room with big table for 6 people and a small bath. An expandable sofa in the living room can be used as an extra big double bed for two more people, has air - condition , satellite big TV, Free WiFi and a big balcony overlooking the harbor. You can relaxin the beautiful space offered the apartment sleep in comfotable beds, enjoy breakfast or a meal in the fully equipped kitchen, has also pans and all necessary serving utensils (such as plates, glasses, cutlery), toaster, coffee maker and juicer. You will also find an oven and hob, microwave, fridge freezer and washing machine. There is an ironing board and iron, and on the balcony there is a clothes horse. We offer you also Parking for your car. 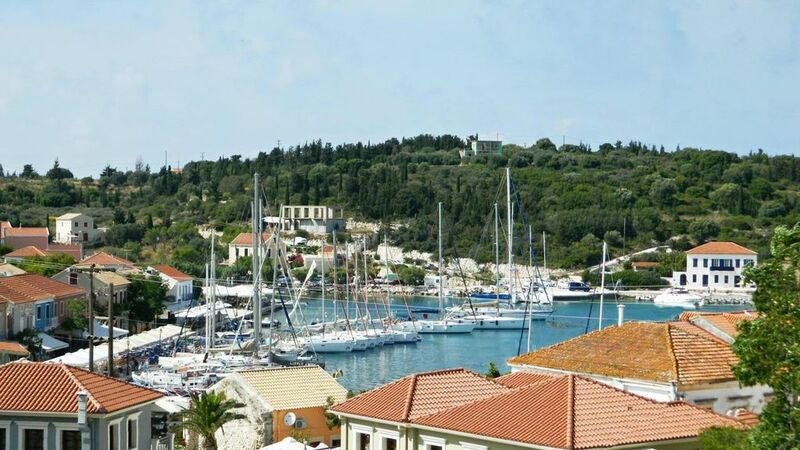 Staying in Fiskardo view apartment does not require neccesary a car. We offer you also Free deluxe boat rental for a day if you book for 4 nights, or tow days if you book for seven nights! A typical day trip aboard one of our comfortable and modern boats can include many activities, that will remain in your memory forever. The calm and safe waters of Fiscardo area are ideal for cruising and also just a few minutes away from Ithaca which you can visit if you want to. Explore private coves and stop for a swim, visit parts of the coastline or eat a picnic lunch on a secluded beach far from the bustling crowds. Enjoy the unique marine life, go fishing, scuba diving or just cruise and snorkel around..... you are the captain! You don't need any special driving license! We offer also to our customers with the boat ( no extra charge) , Coolbox with ice , ice minerals waters , ice fruit juices, also diving masks and beach umbrella! Book your stay and your boat now and let Regina welcome you and host your dream vacation in Kefalonia! My name is Regina Germeni. Airconditioning in all the rooms! We offer you Free ,Private 25hp deluxe boat to explore many beaches arround of Fiskardo and over to Ithaca.You don't need any license! We stayed here for a week with our 3 children -10, 10 & 7 in August. The apartment had an amazing location in central fiscardo with a beautiful view from the balcony. Regina was lovely and very helpful. The apartment was clean and tidy and was also cleaned half way through our week. For a family the apartment perhaps lacked a few things - a kettle - it had a filter coffee machine but nothing to make a cup of tea! And the balcony only had chairs, there was no sunlounger area, so was perhaps not as relaxing as I would have liked. With no outside area apart from the balcony, the children were a little cooped up but did go to the little park nearby on their own from time to time - this was in view of the balcony so seemed safe enough. We loved the vibe of Fiscardo, the cafes, cocktails and restaurants were fab. We enjoyed our week here very much. I'm very happy for that , you have nice time in Fiskardo and in our apartment! Everything is in the cupboards. You never mentioned that you missed something ... if you did , we would serve you immediately! In apartment you can find 2 balconies with tables and chairs also a sofa to relaxed! No sun lounger... But I never ask in site for sun lounger..
We hope to welcome you again some time in the future! Lovely clean well presented property in a great location that was well equipted. Friendly family run apartments. We were a party of 7 and would highly recommend staying here. We will deffo be back. 😃 Thank you so much. Great apartment with amazing view!!!! We will definitely come back!! We can't rate this place highly enough! Regina the owner is most hospitable and helpful. We received a great welcome pack including a bottle of local wine, even though our stay was only for three days. The apartment is so well located. Its just 2 or 3 minutes to stroll into the harbour-side and go to one of the many nice restaurants there. From the large balcony you can relax in the evening sun and look over the town. Plenty of space in the two large bedrooms and kitchen/ lounge for a family or small group of 4,6 or more. TV's and three bathrooms is ideal for a small group with different interests. We very much enjoyed the free use of the boat (fuel extra) over to Ithaca and around the local coves. In quattro amici, abbiamo soggiornato in questo accogliente appartamento, arredato in modo moderno e completo di elettrodomestici. Pulizia impeccabile in tutti gli ambienti: cucina, 2 camere e ben 3 bagni. Ottimo punto di partenza per visitare la cittadina di Fiskardo e per raggiungere il porto. La proprietaria Regina è gentile ed ospitale. Consigliatissimo!! Heerlijk eten tegen reeele prijzen. Auto huren en het prachtige eiland verkennen; wij zeggen doen!! Thank you very much for your lovely comments!I;m very happy for that you have nice time in fiscardo view apartment! We hope to welcome you again some time in the future. Changeover Day: Change over day is flexible. Guests should leave until 10:00am on day of departure and should not arrive before 14:00 Notes on prices: The price include Free boat Rental: if you stay week 2 days boat Free , 4 days staying, 1 day free boat! Free boat from 1 May - end of October ! The price include all taxes, also maid service , change of linen , and towels , beach towels twice a week , cleaning, kitchen paper and soap , napkins, toilet paper , soap, shampoo and shower gel all this fully sufficient for your stay! Also air condition , Free WiFi internet , baby cot and high chair.